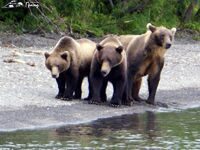 A bear viewing trip is one of the truly great wildlife experiences to any Kamchatka visit. When you see these magnificent animals on their home turf roaming freely along the coastline, catching salmon at rivers, eating berries in the mountains - it's a moment when you forget everything else and just soak in nature at its best. Kamchatka bear watching tours can be added to many itineraries as several different locations to view bears are available. Each option varies in quality, experience and cost. Like nature itself there are no guarantees. Yet there is nowhere better in Kamchatka to see and photograph the bears in their element. You fly to Kamchatka. Fly via helicopter from Petropavlovsk-Kamchatsky to Kurilskoe lake. You will be invited to the voyage around Avacha Bay. Drive to the plateau of Mutnovsky volcano. Fly back home. This itinerary takes you to one of the most remote parts of the world. This program requires flexibility, caution and good humor. Every effort will be made to follow the itinerary; however there is always the possibility of changes.We adhere to the following basic ecotourism principles. Summer season is usually warm and sunny in Kamchatka. However, the weather in Kamchatka is extremely changeable and runs from storms, to heavy rain, to fog or glorious weather. We have no control over weather patterns and so one always has to be prepared for all types of weather. Please be prepared by wearing layered clothing, take woolen or silk underwear and certainly raingear and excellent hiking boots or shoes. Departure for Petropavlovsk, Kamchatka. The flight time is 8.5 hours and there is a plus 9 hour change in time ( from Moscow). Day 1: Arrival to Petropavlovsk-Kamchatsky. Double accommodation in a hotel. Get acquainted with a guide. Sightseeing. T.
After breakfast fly via helicopter from Petropavlovsk-Kamchatskiy to Kurilskoe lake and land at the doorstep of a remote wilderness lodge in prime Kamchatka bear viewing country. The flight offers spectacular scenic views of the Kcudach volcano. Make an excursion to the Schtubelya and Klyuchevoe crater lakes (located in a crater of Ksudach Volcano) and visit hot springs on the lake's shore. Short flight to Kurilskoye Lake. (Some Russian volcanologists consider Kurilskoye Lake to be a large collapsed caldera!). Accommodation in a small cozy wooden lodge on Grassy Point or tents (depends of departures dates). B, L, D, T.
Day 4:Kurilskoe lake, Khodutka River. Price:3600( Dbl) / 3780 (Sgl) Euro per pax for group from 12 pax only! • All transport, including ground transportation, transfers, etc.